From left to right: Ellen Ochoa, former space shuttle astronaut and current director of the Johnson Space Center; Lesa Roe, NASA's deputy associate administrator; Ellen Stofan, NASA's chief scientist; and Dava Newman, the agency's deputy administrator. On March 16, the four women spoke to a group of female high school students about how they came to work at NASA and the challenges of working in a male-dominated field. They may have taken very different roads to arrive at their current jobs, but many of NASA's top female administrators have at least one thing in common: They have shared the experience of being a woman in a male-dominated field. 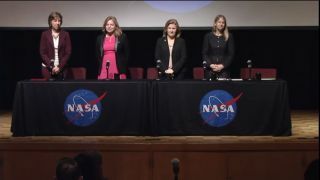 On March 16, these top NASA leaders shared their experiences with a crowd of female high school students at Goddard Space Flight Center in Greenbelt, Maryland. The event, held in partnership with the White House Council on Women and Girls, was part of Women's History Month, and featured a panel of speakers that included Ellen Ochoa, former space shuttle astronaut and current director of NASA's Johnson Space Center; Lesa Roe, NASA's deputy associate administrator; Ellen Stofan, NASA's chief scientist; and Dava Newman, the agency's deputy administrator. As chief scientist, Stofan holds the most senior science position at NASA. She knew she wanted to be a geologist from an early age. "I was the kid that was always picking up rocks," Stofan said. She disliked math in high school but persevered because she knew she needed knowledge in this subject to become a scientist. Ellen Ochoa, former space shuttle astronaut and current director of the Johnson Space Center. Ochoa, on the other hand, loved math — she took her college's entire series of calculus courses "for fun" — but changed her major "about five times," thinking she might study music or journalism. It wasn't until she finished the calculus classes that she realized she might like to pursue physics. In her first year of graduate school, she saw NASA launch the space shuttle program and accept the first women astronauts, and later decided to apply for the program. Newman, who holds the second-highest position at NASA, said she wanted to be a "sports lawyer" in high school but gradually found her way to aerospace engineering, largely because she felt space exploration was a way to promote international peace and cooperation. For Roe, a trip to a community college career center during high school made her consider going into engineering. But it wasn't until her time as an undergraduate, when she enrolled in a co-op program and was able to work at a NASA center every other semester, that she understood that "this is what engineers do and I love it." Those personal stories reflect the preferences and personalities of four very different women, who ultimately arrived in NASA's upper echelon via different paths. And yet all four women shared the experience of being the only (or perhaps "one of two") women in most of their science and engineering classes in undergraduate and graduate school. All four speakers said this trend continued beyond school. Newman said she was one of the first female faculty members at a school where she taught and was later one of the only female faculty members in her department at the Massachusetts Institute of Technology. Roe was the first female director of NASA's Langley Research Center in Virginia, a position she took up in 2005. Once again, the women's differences became apparent when they talked about how that experience made them feel and how they dealt with it. Lesa Roe, NASA's deputy associate administrator and former director of NASA's Langley Research Center. "It's changed a lot throughout my career," Ochoa said. "It was harder when I was young. In college and graduate school and early on in my career, I was often the only woman in a class or one of two. And I felt self-conscious. I felt like I stood out. It made me a little bit reluctant to raise my hand and ask a question." Ochoa said she began going to her professors' office hours to ask questions, which ended up boosting her confidence because those teachers were eager to talk to her. "I don't really notice I'm a woman in the room, because I'm a member of the team," Roe said. "In electrical engineering and in college, I was often the only woman in the room, and it's more in hindsight that I remember it. When I was in the room, it might just be a real quick thought, but it didn't faze me in any way. And within NASA, I've always been one on the team. I've been one of the people getting the job done." Roe said she's known women who feel more confident stepping into a job if they have seen another women hold the role before them. However, "I never did," she added. "I never thought about it that way. For me, it really hasn't been a barrier or anything." Stofan, on the other hand, said her struggle to feel like part of the team had more to do with other people's isolating comments. Ellen Stofan, NASA's chief scientist and extraterrestrial planetary geologist. "So, a lot of times, especially early in my career, when I wasn't self-confident, I would feel like, 'I have to work twice as hard just to be taken half as seriously.' But as I got more confident, I realized, 'They actually need me here,'" Stofan added. Stofan said that, for inspiration, she thought about people like Katherine Johnson, an African American woman who began working for the National Advisory Committee for Aeronautics (NASA's predecessor) starting in 1953 and did critical work on the Mercury program in the 1960s. She retired from NASA in 1986, and earned multiple awards and honorary degrees for her work. In 2016, she was awarded the Presidential Medal of Freedom, the highest civilian award in the U.S.
"Channel your inner Katherine Johnson," Stofan advised the high school students. "If anybody ever makes you feel like you don't belong in that room, remember her, and say, 'I'm going to be like Katherine Johnson, and I'm going to feel like I belong — because I do, and they need me here to get this work done.'" Prior to the panel discussion, Jo Handelsman, associate director for science at the White House Office of Science and Technology Policy, held a separate discussion. In the talk, she discussed changes that should take place in science, technology, engineering and mathematics (STEM) education, to help increase the number of women and minorities who choose to study science and who continue on into science-related careers. "The first thing we have to do is change the way we teach STEM in the classroom — and that's throughout, from kindergarten all the way through graduate school," Handelsman said. The changes include making STEM lessons more hands-on and engaging, such as including activities that let students create and engineer things, and "not just reading in a textbook about things that other people have discovered or invented," she said. "Those are good teaching techniques for everyone, but they have a differentially positive effect on women and minorities," Handelsman continued. She added that women and minorities are more likely to seek careers that focus on real-world problems, either in their community or on a global scale. Thus, students need to see the connection between STEM careers and solving those types of problems, she said. Dava Newman, NASA's current deputy administrator. The White House Office of Science and Technology Policy is focused on changing the way STEM and the people who do STEM are represented in the media, Handelsman said, and a movie about the life of Katherine Johnson is in the works. Ochoa wrapped up her comments on the panel by talking about one of her responsibilities at Johnson Space Center, which is to make recommendations for nominees for the National Medal of Technology and Innovation. "One of the criteria is that the [invention] needs to have made a major impact on society," Ochoa said. Because inventions and innovations often take decades to make an impact on the world, many of the nominations Ochoa said she reads are for work done about 30 or more years ago. "Because of that, very few of the people that we read about are women," Ochoa said. "And I always sit there and think, 'Well, I certainly hope that, as we're doing this 20 or 30 years from now, we'll see a lot more women who have been involved in inventions that have now grown into companies or products that have a great impact on society.'"